Howdy! Senior writer Jason Heller here. Just wanted to let you know that Fantastique, The A.V. Club’s monthly fantasy film series, continues tonight at Alamo Drafthouse Denver with the 1980 fantasy epic Hawk The Slayer. 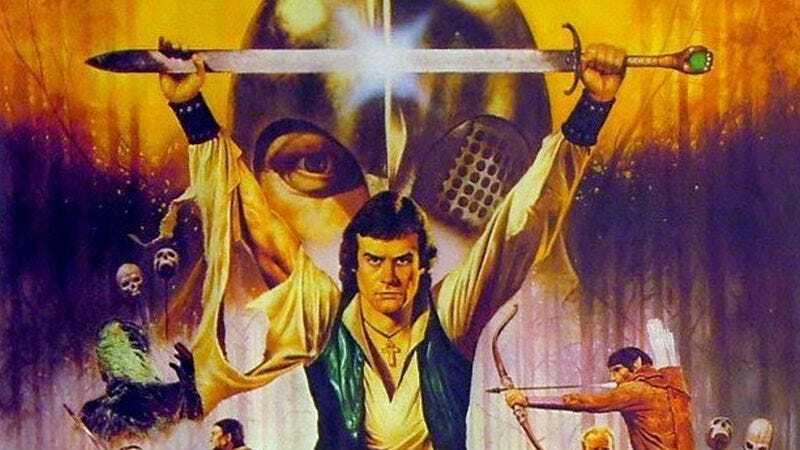 Before Highlander, Excalibur, or Conan The Barbarian, Hawk The Slayer set the tone for the sword-and-sorcery boom of the ’80s with the help of John Terry (later of Lost fame) and the legendary Jack Palance, who star as brothers battling for the power contained in their late father’s mysterious mindstone. Elves, dwarves, witches, and giants abound, all thanks to writer-director Terry Marcel’s keen eye for classic mythmaking (admittedly on a tight budget). And speaking of budgets: Marcel is currently crowdfunding the long-awaited sequel to Hawk The Slayer, titled Hawk The Hunter, which was first planned and then abandoned way back in the early ’80s. Marcel’s Kickstarter campaign runs through October 1. I had the pleasure of interviewing Marcel via Skype recently about Hawk The Hunter as well as the enduring appeal of Hawk The Slayer, and that interview will be shown before the screening tonight. Like Science Friction (Fantastique’s sister series at Alamo that focuses on science fiction films), Fantastique is curated and hosted by yours truly. I’ll be there tonight in person to introduce Hawk The Slayer and to pick the winner of this month’s giveaway: a hardcover copy of The Grace Of Kings, the debut fantasy novel by Hugo-, Nebula-, and World Fantasy Award-winning author Ken Liu, courtesy of Saga Press/Simon & Schuster. I’ll also be giving away one pass to MileHiCon, Denver’s oldest and largest science fiction/fantasy convention, which will take place October 23-25. And furthermore: In honor of one of Hawk The Slayer’s most memorable scenes, the kitchen at Alamo Drafthouse will be offering a special snack treat tonight: sugared turkles! If you’ve seen the film, you get the reference. If not, well, order them and find out. What’s the worst that could happen? Like all Fantastique and Science Friction screenings, this event is sponsored by The A.V. Club. Tickets for Hawk The Slayer are on sale now.